Car seat safety is an important topic during childhood. As parents, we want to make sure our children are always safe, especially in the car. With the sudden surge of conversation about car seat installation and safety, it is sad that reports from the National Safe Kids Campaign are showing that 4 out of 5 car seats are improperly installed. For some reason, this topic has become one of heated debate. However, here at BFMT, we feel that the issue is one that is pretty easy to understand. This entry is to give you some simple information to ensure your child is safe from the moment they get in the car until the moment they get back out. I’d like to start with the basic recommendations. Currently, the AAP recommends that all children are kept rear-facing until the age of two, or until they reach the maximum height and weight requirements for their seat. This ensures the child is in the best position during an accident, with the least amount of stress on the head and neck. When moved to forward facing after the age of 2, it is recommended that a child remain in their Forward-Facing seats for as long as possible, until they meet the height and weight requirements of their seat. Children above the height and weight requirements for a Forward-Facing seat should still remain in a Belt-Positioning Booster seat until the vehicle's seat belt fits properly without - typically between ages 8 to 12, or until the height of 4 ft, 9 inches. Weight is not a factor in moving out of a booster, only height! While using the correct seat in the correct positioning is obviously important, many times the issue comes from proper installation and placement of the child within the seat. When installing your seat, you should decide to either use the LATCH or the seat belt installation. While it might be tempting to think that if one system is safe, two would be better, this line of thinking is actually incorrect. Seats are tested using only one form of installation at a time, and the safety may be compromised. Pick an installation method and stick to it! Your child’s seat should sit firmly in place, with as little wiggle room as possible. It may take some time and effort to really get it stationary, but the tighter the installation, the safer your child is during a crash.Your seat should never be able to wiggle more than an inch in any direction. If you question the installation of your seat, there are resources available with certified and trained inspectors to check your seat. Call your local fire department, or AAA office, to find the inspector closest to you. They can help give you peace of mind on your seat’s installation. Lastly, the placement of your child within their seat. Straps should always be tight to your child, but not suffocating. To be sure of safety and comfort, use the finger check. place two fingers under the straps at your child’s collarbone. Two fingers is all you should be able to fit. This ensures a tight fight, and still leaves the room for your child’s comfort. Retighten your straps EVERY TIME your child gets in their seat, to be sure they are safe. Another good test to see if its tight enough - if you can pinch the straps, its too loose! The chest restraint should always be at armpit level. Too low or too high can impair the seat’s ability to safely restrain your child in the case of an accident. 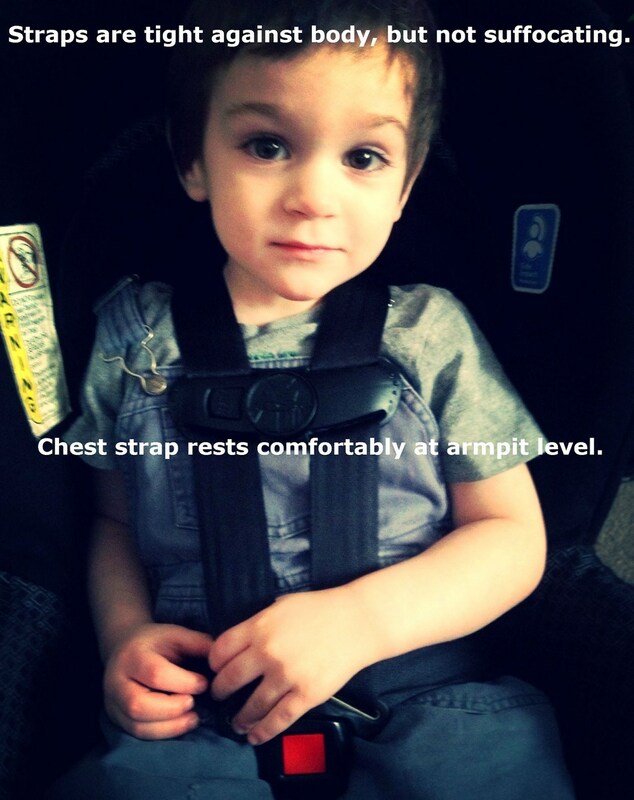 Armpit level ensures that the restraint will be tight again their bodies and keep them securely in their seats. While installation and placement are highly important, as stated above, did you know that your use and care of the seat can also impact your child’s safety? Here are some more tips to ensure your seat will be most effective and your child’s safety at its highest possible level. 1) If you are ever in an accident, even a tiny fender bender, the safest thing is to get a new seat for your child. Even the tiniest accident can stretch your child’s belt system, and render it less effective later. To avoid stretched belting systems, replace your seat in the event of ANY accident. When you toss your old seat in the trash, cut the straps so that no one may pick it up and use it for their own child in the future. 2) Did you know washing your belt system can make it less effective? Instead of throwing the belts in the wash with the cover, wipe them down with a damp cloth and let them air dry before reassembling your car seat. 3) Never buy a secondhand seat or one that you do not have the history for. It may have been in an accident, and might not be safe anymore. 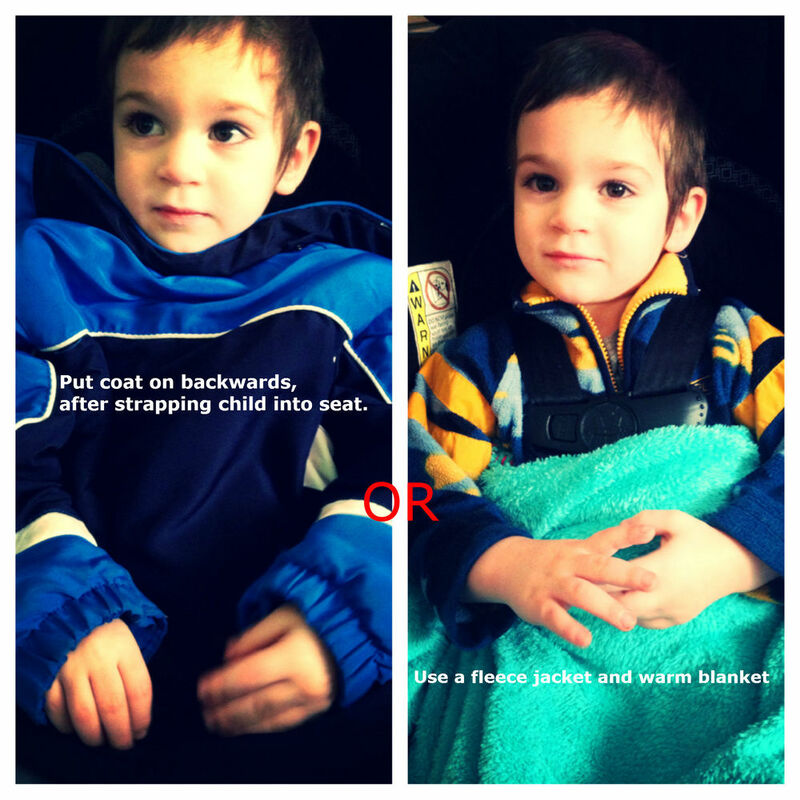 4) Do not put your child in their seat with a heavy winter coat. Thick winter coats can impair your seat’s.This is perhaps the most controversial but most important during this time of the year - restraint system in the case of a crash. Thick winter coats which require adjustment of the straps are dangerous. In an accident, the coat will compress and allow for too much slack between your child and their restraint system. There have been cases of kids being ejected from an otherwise properly installed seat, all because of their coats. Instead, consider a light fleece jacket and blankets, or putting your child’s coat on backwards over their straps after they are securely in their seat. You should never need to loosen your child’s car seat straps for an item of clothing. If you do, please wait to put that item of clothing on until after you get to your destination. If possible, warm up your car for several minutes before entering. Otherwise, use lots of blankets and fleece jackets which do not require movement of the seat’s restraints. Your child can still be warm. Put the coat back on after you reach your destination! 5)Regularly check your car seat’s expiration date. All seat’s expire 5-8 years after manufacture. Your child’s expiration will be printed into the plastic, somewhere on the back or bottom of your child’s seat. Never use an expired seat; the materials may have worn down and will not be effective in protecting your child during an accident. 6)One last safety tip- place a small label on the side of your car seat with your child’s basic info; Name, birthday, mom’s name and phone number, dad’s name and phone number, address, allergies, and any known medical conditions. Place this on your seat where paramedics can easily see it. While obviously this blog is not all-encompassing of every piece of car seat safety information there is, we hope that this has helped you and that you can take the information within and put it to good use. Your child’s safety is of the up-most importance to all of us here and BFMT and we want to be of help in any way we can! If you still have questions, feel free to message us and we shall get back to you as quickly as we are able. Links to other resources: AAP recommendations on carseats.